Top 25 Gospel Praise Songs 2017 Edition boasts 25 of the most popular praise & worship songs being sung in churches across the country this year produced with Gospel music stylings by 2x Stellar Award winning artist and producer Phillip Carter and performed by leading voices in the Gospel Music Workshop Of America (GMWA). The Top 25 franchise has sold nearly 2 million units since its inception and this brand extension will continue the best-selling tradition. 2017's double CD bows with much fanfare and includes unforgettable Gospel songs of praise & worship. 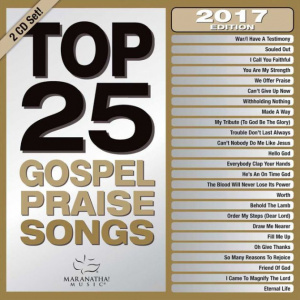 Top 25 Gospel Praise Songs 2017 Edition includes new recordings of songs originally written and recorded by artists and writers such as Anthony Brown Andrae' Crouch Travis Greene Israel Houghton Donnie McClurkin William McDowell Hezekiah Walker and many more! This double set is a must-have for every Gospel fan! Top 25 Gospel Praise Songs 2017 2CD by Maranatha was published by Capitol CMG in October 2016 and is our 1212th best seller. The ISBN for Top 25 Gospel Praise Songs 2017 2CD is 0738597240720. Be the first to review Top 25 Gospel Praise Songs 2017 2CD! Got a question? No problem! Just click here to ask us about Top 25 Gospel Praise Songs 2017 2CD.